I spent the last few nights helping at our local library's annual book sale and came across a swell volume. It is a large and weighty folio titled The Art Journal for 1875 published by Appleton of New York. It is filled with lovely steel engravings and the faint whiff of damp didn't deter my spending $5 for it. While leafing through it last night, I came across an article titled The Bryant Testimonial Vase: A First Showing of the Proposed Designs with large engravings of the designs submitted by Tiffany, Gorham, Whiting, Starr & Marcus, and Black, Starr & Frost. This may be old news to some, but I thought it might be of interest to post them up and see if we agree with the decision of the jury. Tiffany & Co; design by James Whitehouse; 30 inches tall, of oxidized silver. Gorham Company; design by T. J. Pairpont; vase: 4 feet tall (! ), base 30" in diameter, of burnished and oxidized silver. As the value of raw silver would have greatly exceeded the monies offered, Gorham proposed to pay the difference out of pocket. Whiting Company; design by Charles Osborne; 38 inches tall, a combination of marble and oxidized silver with gilding. Starr & Marcus; no designer named; 32 inches tall, 500 ounces in weight, the whole of sterling silver, gilded. Black, Starr & Frost; no designer named; 42 inches tall, of oxidized silver enriched with inlaid gold. So who would you have chosen? truly interested, I will do a transcription. The first time we saw The Bryant Vase it rocketed to the top of my list of favorite pieces of presentation silver. All of the above designs are great. Understanding more about the allegorical figures and motifs might change my opinion but having seen Tiffany's finished product it remains my first choice. I guess the original of The Bryant Vase is in the Met? I saw a copy(?) several years ago, though, in the Arts & Industries Bldg. of the Smithsonian, since it was supposed to have been shown at the 1876 Centennial in Philadelphia, and a core collection of Centennial objects went to the Smithsonian afterward. I, too, fell in love with it at first sight. Earlier this year I went back to visit it, but the powers that be had completely changed the layout of the A&I Bldg. I asked at the information counter where The Bryant Vase had gone, but no one could tell me anything. Does anyone know this copy's current whereabouts? Also see: old trophies thread. Does anyone know if these designs were ever used for other things? Be warned: it is nearly 5 megs in size. While we're on the subject, here is a souvenir publication one could have purchased at the 1876 fair. 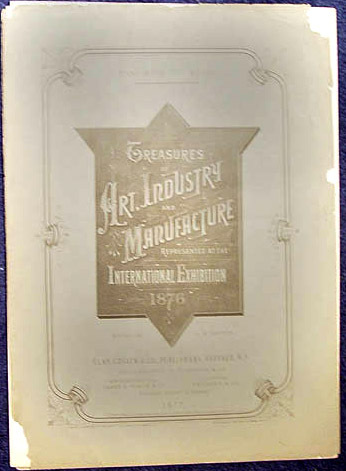 It is a large (about 19" x 14") folio titled "Treasures of Art, Industry, and Manufacture Represented at the International Exhibition 1876". The inside features a promotional, two-page article about the Bryant vase, printed once in English and one in French, as well as a beautiful chromatographic of the vase itself. According to the cover of this item, it is volume 26, so presumably many of the major objects on display at the fair had an accompanying souvenir folio. This one is printed on the cover with its original price of $2, which, accounting for inflation, seems to be a fairly pricey souvenir. A link to a short description of the Bryant Commerative vase: 'The Bryant Commemorative Vase', 1874.